Are your books two years behind? Not even setup? Can’t seem to reconcile that credit card account? 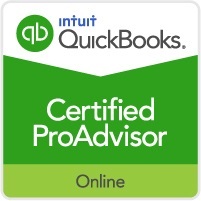 We specialize in thorough one-time cleanup services and QuickBooks set-up. We’ll get you caught up so you can file taxes, apply for loans, prepare for an audit, or just have CLEAN BOOKS for a change! 1. Count the number of bank accounts to be reconciled. 2. Determine how many years need to be reconciled/cleaned up. 3. Select a cleanup package and any additional services needed. We’ll also review your account to help you choose the appropriate services. (TIP: A “bank account” in QB includes checking, savings, credit card, money market, and line of credit. Be sure to mention if you have a PayPal account). (There is an additional cost for these and other services, special cleanup requests, complex issues, and high volume of work). *Setup fee applies to both new/empty QBO accounts AND existing accounts requiring a significant amount of setup (customer lists, etc.). **Manual data entry fee applies to both new/empty QBO accounts AND existing QBO accounts requiring a significant amount of transaction data entry into QBO. Fees may be assessed while work is being completed and will be added to existing engagement agreement after client is notified.